If your house is near the water and you are tired of seeing the monotonous blue water then this texture pack will replace the color of water specifically for you. Water texture can be red, yellow or greenish depending on what you choose. Experiment by switching between the packs and in the end you will find the best one that you like. 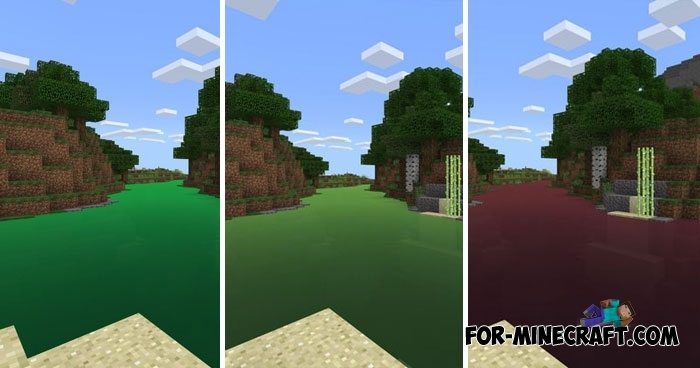 In fact, if you are looking for realistic water and want to see ripples or waves looking at rivers, seas and oceans, then you need to install one of the shaders for Minecraft Bedrock, which in addition to water adds more realism. How to install Colorful Water?